In 1775 American independence was not a foregone conclusion. While there had been unrest and resistance in Massachusetts with scattered acts of support from other areas, no organized movement toward revolution existed across the Colonies. Virginia ranked among the largest, wealthiest, and most populous colonies in 1775, and her political and military support for independence would be crucial for success. In this speech Patrick Henry (1736–1799) uses powerful rhetoric to convince influential, affluent, landed men of Virginia with much to lose to move past their current diplomatic posture opposing British aggression to the more treasonous one of open military preparedness. Patrick Henry, speech to the Virginia Convention, March 23, 1775. 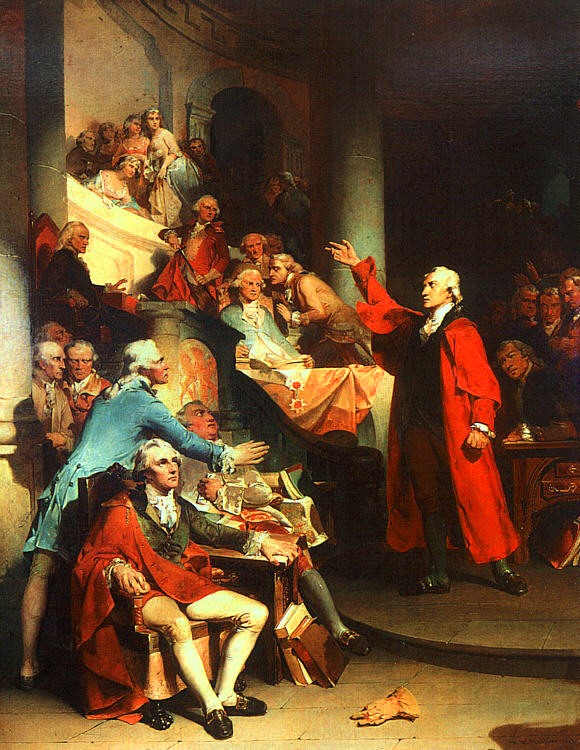 In this lesson students will deconstruct Patrick Henry’s famous speech to explore the tools of effective persuasion, including appeals, rhetorical strategies, and classical argument. This is a persuasive speech, one intended not only to present an argument but also to persuade the audience to act. While the speech can be used to investigate issues of freedom, power, and rights of the governed, this lesson focuses upon effective rhetoric. The speech includes several Biblical allusions — revolutionary rhetoricians often used Biblical references because it allowed them to speak more strongly against Britain without using overtly treasonous speech. The text of this speech is well known; less well known is the fact that there was no actual transcript created of Henry’s speech — after all, these discussions smacked of treason, and keeping a written record would have been dangerous. In an environment of digital media and world-wide instant communication, students may wonder how Henry’s words were preserved. This speech was recreated in 1817 by William Wirt of Maryland, who published the first biography of Patrick Henry. Wirt drew upon materials collected beginning in 1808, including interviews with those who knew Henry and those who were present when the speech was delivered. For an electronic version of Wirt’s book, visit this link: Sketches of the Life and Character of Patrick Henry. The provenance of the speech notwithstanding, Henry’s words provide a rich source to study rhetorical strategies and classical argument, and that study is the focus of this lesson. This text divides into four sections aligned to the arrangement of classical argument. The first two paragraphs form the introduction (Exordium). The Exordium attempts to engage the audience, to prepare them for the message to come, and to explain the purpose (thesis) of the speech. The third paragraph provides the statement of fact (Narratio) and argument (Confirmatio). The Narratio contextualizes the argument, presenting any background information necessary, while the Confirmatio explains the evidence that supports the thesis. The fourth paragraph presents and refutes counter arguments (Refutatio). The final paragraph forms the conclusion (Peroratio). The Peroratio serves several purposes: to restate an argument, to amplify reasoning, to inspire an audience, and to rouse emotional responses. Each paragraph is accompanied by a number of close reading questions designed to invite student analysis in four major areas: classical argument structure, diction and syntax, rhetorical strategies, and argumentative appeals (logos, ethos, and pathos). This lesson is divided into two parts, both accessible below. The teacher’s guide includes a background note, the text analysis with responses to the close reading questions, access to the interactive exercises, and a follow-up assignment. The student’s version, an interactive PDF, contains all of the above except the responses to the close reading questions and the follow-up assignment. In 1775 unrest bubbled through the American Colonies. Britain had severely restricted Massachusetts through the Intolerable Acts; towns were voting to boycott British goods, and British soldiers were becoming a common sight in the American Colonies. 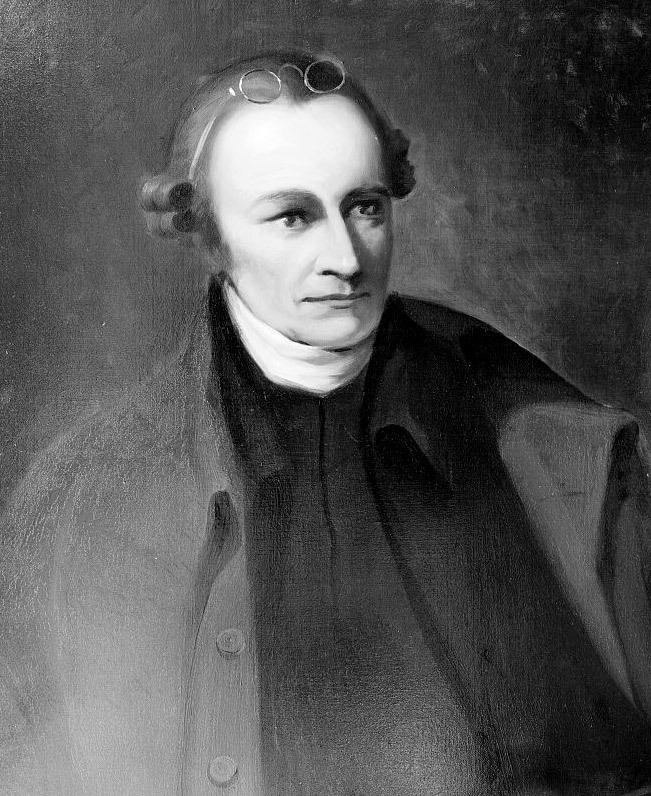 In this lesson you will explore a famous speech by Patrick Henry (1736–1799), member of the Second Virginia Convention. Patrick Henry is not speaking in the Virginia House of Burgesses [the state legislature] in Williamsburg because it had been dissolved the year before by Royal Governor Dunmore. Resenting this British interference with local government, the members of the House of Burgesses regrouped as a state convention. In order to avoid any interference from British troops, the Second Convention of approximately 120 delegates met in Richmond, Virginia, from March 20 through March 27. The American Colonies were attempting to negotiate with British in 1775, and many of Henry’s fellow delegates wanted to wait until these negotiations were completed before taking action. But Henry felt that delay would be a major mistake. On March 23, 1775, he asked the Virginia Convention to take a defensive stance immediately against Great Britain by raising an armed company in every Virginia county — an action considered by many to be open treason. His speech reflected language and actions far more radical that his fellow delegates were willing to go in public, but Henry based his request upon the assumption that even more aggressive military actions by the British would soon follow. Twenty-seven days after this speech was delivered the Battles of Lexington and Concord proved Henry correct. In this lesson you will look at Patrick Henry’s speech and analyze his methods for convincing his fellow members of the Virginia Convention to take a military stance against the British. These delegates were wealthy and powerful and they had much to lose; Henry’s request was a big decision that many of them were reluctant to make. Henry used not only rhetorical devices but also the strategies of classical argument, making a potentially confusing situation simple and straightforward as he attempted to move all his fellow delegates toward the same result. His recommendations were accepted by the Convention. The speech divides into the four parts of a classical argument, defined below. As you analyze the individual parts of the speech, look also for how these parts of the argument work together. The first two paragraphs form the introduction (Exordium). The Exordium attempts to engage the audience, preparing them for the message to come, and to explain the purpose (thesis) of the speech. The third paragraph provides the statement of fact (Narratio) and argument (Confirmatio). The Narratio contextualizes the argument, presenting any background information necessary, while the Confirmatio lays out in order the evidence to support the thesis. The final paragraph forms the conclusion (Peroratio). The Peroratio may perform several purposes: to restate an argument, to amplify reasoning, to inspire an audience, and to rouse emotional responses. 1. The first paragraph of classical argument, the exordium, seeks to engage the audience and prepare them to hear the speaker’s message. Give an example in this paragraph of an attempt to engage the audience and an example of an attempt to prepare the audience. 2. Another function of the exordium is to explain the purpose of the speech. What purpose does Henry establish, and to what is he appealing in order to emphasize this purpose? The purpose of the debate, of which this speech is a part, is to “arrive at truth” and fulfill the “great responsibility which we hold to God and our country” (sentence 6). He is appealing to the ethical integrity of his audience by articulating their earthly and heavenly responsibilities. 3. Why does Henry use the term “gentlemen” twice in the first two sentences? In order for others to accept a different idea, they must first believe they are being respected. Henry seeks to establish his respect for those who do not agree with him by referring to them as gentlemen. In addition, Henry is hoping to imply that since he is also a member of the Convention that they will give him and his ideas the same respect. 4. Why does Henry begin the second sentence with “but”? This is a rhetorical shift in perspective that helps to prepare his audience. Even though he is a fellow member of the Convention, he uses a rhetorical shift to explain that what he will say from that point on will be different than that heard before. 5. In sentence 3 what does Henry mean when he says, “this is no time for ceremony”? Why does he use the term “ceremony”? He means this is no time to simply say things because they might sound conciliatory, since ceremonies are often for visual display rather than actual action. He is emphasizing the time-sensitive nature of this debate and establishing the importance of immediate, serious discussion rather than a postponement of the issue (recall that some members of the Convention wished to wait until negotiations had run their course before beginning military preparedness). 6. What does Henry mean by “awful moment” in sentence 4? Why does he use this phrase? He means that the question under discussion is extremely important with potentially life-changing consequences. He is recognizing the treasonable nature of this discussion, displaying not only his own courage but asking his fellow delegates to show courage as well. 7. In sentence 5, when Henry states, “I consider it as nothing less than a question of freedom or slavery,” he commits a logical fallacy. The false dichotomy (either-or) fallacy gives only two options with no choices in between, and Henry uses this intentionally. Why? By eliminating other options he is focusing his argument. He wants the listeners to understand that there are only two options; freedom, which he is advocating, or slavery, which he knows these proud, wealthy men, many of whom are slaveholders, will not tolerate. 8. In sentence 7 Henry argues on the basis of “ethos,” which is Greek for “character.” Such an argument is called an “ethical appeal.” It attempts to win over listeners on the basis of the trustworthiness of the speaker. How, in this sentence, does Henry suggest that his listeners can trust him? By appealing to religion as he calls upon the “majesty of heaven,” Henry makes an ethical (ethos) appeal that his audience will understand intellectually and emotionally. The Convention members consider themselves to be men of integrity and ethics, as Henry acknowledged in sentence 1. In sentence 7 Henry is asking them to understand that he likewise is compelled to speak based on his own sense of integrity (if he holds back, he would consider himself “guilty of treason”). He reminds his audience that he, like them, is a believer and is trustworthy. 9. How does the ethical appeal in sentence 7 relate to the ethical appeal in sentence 1? In sentence 1 Henry acknowledges the patriotism of the members of the House who have just spoken. In sentence 7 he enumerates his own ethics, stating that he must speak now or be guilty of both treason to his country and disloyalty to the “majesty of heaven.” This reaffirms his trustworthiness with his audience. MR. PRESIDENT: (1) No man thinks more highly than I do of the patriotism, as well as abilities, of the very worthy gentlemen who have just addressed the House. (2) But different men often see the same subject in different lights; and, therefore, I hope it will not be thought disrespectful to those gentlemen if, entertaining as I do, opinions of a character very opposite to theirs, I shall speak forth my sentiments freely, and without reserve. (3) This is no time for ceremony. (4) The question before the House is one of awful moment to this country. (5) For my own part, I consider it as nothing less than a question of freedom or slavery; and in proportion to the magnitude of the subject ought to be the freedom of the debate. (6) It is only in this way that we can hope to arrive at truth, and fulfill the great responsibility which we hold to God and our country. (7) Should I keep back my opinions at such a time, through fear of giving offence, I should consider myself as guilty of treason towards my country, and of an act of disloyalty toward the majesty of heaven, which I revere above all earthly kings. 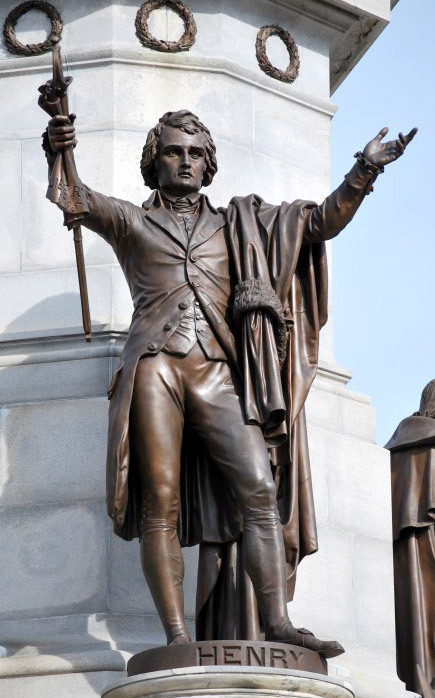 Statue of Patrick Henry, Richmond, Virginia. 10. In this second paragraph of the exordium, Henry works to explain the importance and timeliness of his argument by setting up a contrast between illusions and truth in sentences 8 and 12. According to Henry, which will his argument contain and which will it NOT contain? He states that it is “natural to man to indulge in the illusions of hope” but in the last sentence of the paragraph he clearly says he will not do that — he will know the “whole truth.” His argument will contain truth but will not contain illusions. 11. Henry uses the word “hope” several times in this speech. Give an example of an “illusion of hope” that Henry suggests in this second paragraph. One illusion would be the idea that the Colonies and Great Britain could negotiate an acceptable peace without war. 12. Allusions, unexplained references to other sources, are commonly based upon the Bible or mythology. What allusion does Henry use in sentence 9 when he says “listen to the song of that siren till she transforms us into beasts?” How does this allusion contribute to his argument? He is alluding to the sirens found in the epic The Odyssey. Siren calls are alluring and hard to resist even if expected, but they can be deadly. Henry is saying that to listen to this call, this “illusion of hope”, even though it is tempting, will prove fatal and transform the Convention into something unable to reason and act (beasts). 13. Henry uses multiple biblical allusions with which his educated audience would be familiar. In sentence 11 he says “Are we disposed of the number of those who, having eyes, see not, and, having ears, hear not.” This is from Ezekiel 12:2, when god describes how those who hear Ezekiel’s words and do not listen will be destroyed. How does this allusion contribute to Henry’s argument? Henry is implying that not seeing or listening to his argument will lead to destruction. 14. Juxtaposition means to put two elements side by side, often for comparison. Henry does this in sentences 11 and 12. What is his purpose in first asking if they are “disposed to… see not, and… hear not” and then stating, “…I am willing to know the whole truth: to know the worst, and to provide for it”? He again sets up a choice for his audience. Would they rather ignore the situation and have dangerous outcomes (this choice is defined by the previous allusions to the sirens and Ezekiel) or instead know the truth and prepare? He clearly indicates that he chooses the second option. (8) Mr. President, it is natural to man to indulge in the illusions of hope. (9) We are apt to shut our eyes against a painful truth, and listen to the song of that siren till she transforms us into beasts. (10) Is this the part of wise men, engaged in a great and arduous struggle for liberty? (11) Are we disposed to be of the number of those who, having eyes, see not, and, having ears, hear not, the things which so nearly concern their temporal salvation? (12) For my part, whatever anguish of spirit it may cost, I am willing to know the whole truth; to know the worst, and to provide for it. 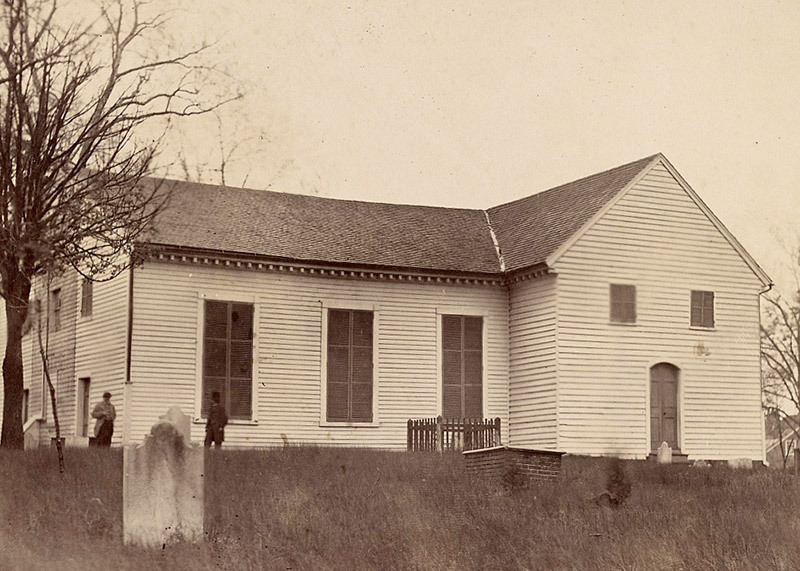 Henry delivered his 1775 speech at St. John’s Church in Richmond, Virginia. The Narratio contextualizes the argument, including presenting any background information necessary, while the Confirmatio lays out in order the evidence to support the thesis. Henry lists several negotiation attempts by colonists and British responses. He uses rhetorical strategies and appeals to further develop his argument, making sure that each item is contextualized from the Colonial perspective. 15. Henry begins this paragraph with another Biblical allusion, “one lamp by which my feet are guided” (Psalms 119:105). Rather than the word of God, which is the lamp found in the Biblical verse, what is the lamp that Henry uses to guide his feet in sentence 13? Why does he make this connection? The lamp is experience. Henry recounts past experiences and events that “guide his feet” and make fighting a necessity. 16. Henry continues to use “gentlemen” in this paragraph. Why? He wants to maintain his respect for his audience and remind them that he is one of them. As his argument builds he wants to take them along with him — reiterating the fact that they are esteemed colleagues. 17. What does “solace” mean? Why does Henry use this term? “Solace” means comfort in distress. Henry cautions his audience that the “hopes” of the past may have been used to comfort the Convention, but such comfort is an illusion and will not last. 18. Henry uses parallelism (structuring phrases in similar fashion) several times in this paragraph. Consider sentence 40, especially the verbs. How does Henry use both parallelism and verb choice (diction) to explain that the Colonies have tried many steps to maintain peace? “We have petitioned; we have remonstrated; we have supplicated; we have prostrated; [we] have implored…” He uses the parallel structure to indicate the process by which the Colonies have taken multiple steps to resolve differences. He chooses verbs that are increasingly dramatic to remind his audience that the Colonies have tried everything without result. Consider “petition” (to bring written grievances) versus “remonstrate” (to forcefully protest) versus “supplicate” (to beg earnestly or humbly) versus “prostrate” (to totally submit) versus “implore” (to beg desperately). 19. In the second paragraph Henry spoke of the “illusions of hope.” In sentence 43 he says, “There is no longer any room for hope.” Why did he use this term again? He is linking this part of his argument to the exordium and explaining that any chance of hope no longer exists. He is moving his audience away from the position of illusive hope that they may have held at the beginning of his speech toward another position. 20. Henry again makes a Biblical allusion in sentence 18, “Suffer not yourselves to be betrayed with a kiss.” Christ was betrayed by his disciple Judas through the kiss of brotherhood, which led to Christ’s arrest and crucifixion (Luke 22:47). Who does Henry believe represents Judas and how does this allusion as a metaphor contribute to Henry’s argument? He believes the British represent Judas and that while they will appear brotherly to the Colonies they will betray, leading to Colonial downfall. 21. Antithesis means to put two ideas together in order to contrast them, pointing out their differences. In sentence 20, what does Henry contrast with “love and reconciliation”? What is the effect? He contrasts them with “fleets and armies.” The effect is to highlight the fact that Great Britain does not consider “love and reconciliation” a viable strategy, since they have responded with “fleets and armies,” and these should be “the last arguments to which kings resort.” Henry emphasizes that Great Britain has already taken the matter past the diplomatic phase to the military level. 22. Hypophora is a special type of rhetorical question whereby a question is asked and then answered by the speaker (as opposed to a typical rhetorical question, which is either not answered or has a yes/no answer). A hypophora is useful to present to an audience issues they may not have considered in depth. Find at least one example of hypophora in this paragraph and explain its contribution to Henry’s argument. “Are fleets and armies necessary to a work of love and reconciliation?” “These are the implements of war; the last arguments to which kings resort.” (sentences 20 and 23). Henry emphasizes the seriousness of the military response that Great Britain has already displayed. “Has Great Britain any enemy, in this quarter of the world, to call for all this accumulation of navies and armies?” “No, sir, she has none. They are meant for us; they can be meant for no other.” (sentences 26 and 27). Henry points out that the British military response cannot be interpreted as anything other than a direct challenge to the Colonies. “And what have we to oppose to them? Shall we try argument?” “Sir, we have been trying that for the last ten years.” (sentences 30, 31, and 32). Henry reminds his audience that the Colonies have been trying to negotiate for ten years without results. 23. Henry first mentions slavery in paragraph one when he contrasts it with freedom. Find an example of slave imagery in this paragraph. What is Henry’s purpose in using this image in paragraph 3? In sentence 29 Henry states, “They [the armies and fleets] are sent over to bind and rivet upon us those chains which the British ministry have been so long forging.” He wishes to continue the image of slavery to explain that the Colonies have used argument to combat the attempts of the British to enslave them, but these efforts have failed. Convention delegates included slaveholders who would recognize and recoil from this imagery. 24. Rhetorical parenthesis is the insertion into a sentence of an explanatory word or phrase. Consider sentence 42, “In vain, after these things, may we indulge the fond hope of peace and reconciliation.” Identify the parenthesis and Henry’s purpose for including it. 25. Metonomy and synecdoche are special types of metaphors. In a metonomy, something strongly associated with an element is substituted for it (for instance, “The White House” is substituted for “the President”). In a synecdoche, part of an element substitutes for the whole (for instance, “farm hands” means “farm laborers”). Find an example of metonomy and synecdoche in this paragraph and identify what each represents. “The foot of the throne” (sentence 41) is metonomy, representing the King. “Tyrannical hands of the ministry and Parliament” (sentence 40) is synecdoche, representing the British government. 26. Henry finishes this paragraph with an appeal to logic in the form of an “if… then” statement. What is the “if… then” statement in this paragraph? He states in sentence 44, “If we wish to be free… [then] we must fight”! 27. Henry builds to a syllogistic argument, an appeal to logic, at the end of this paragraph. Identify the three parts of his syllogism (Major premise [A], Minor premise [B], and Conclusion), citing evidence from the text. Major premise [A]: We must either talk or fight to achieve results. Minor premise [B]: Talking does not achieve results. Conclusion: Therefore, we must fight to achieve results. 28. In this paragraph Henry uses emotional appeals, language intended to create an emotional response from the audience. Choose three examples of emotional language from excerpt 3. You may choose words, phrases, imagery, or other language elements. For each of your examples explain how they are intended to arouse Henry’s audience. (13) I have but one lamp by which my feet are guided; and that is the lamp of experience. (14) I know of no way of judging of the future but by the past. (15) And judging by the past, I wish to know what there has been in the conduct of the British ministry for the last ten years, to justify those hopes with which gentlemen have been pleased to solace themselves, and the House? (16) Is it that insidious smile with which our petition has been lately received? (17) Trust it not, sir; it will prove a snare to your feet. (18) Suffer not yourselves to be betrayed with a kiss. (19) Ask yourselves how this gracious reception of our petition comports with these war-like preparations which cover our waters and darken our land. (20) Are fleets and armies necessary to a work of love and reconciliation? (21) Have we shown ourselves so unwilling to be reconciled, that force must be called in to win back our love? (22) Let us not deceive ourselves, sir. (23) These are the implements of war and subjugation; the last arguments to which kings resort. (24) I ask, gentlemen, sir, what means this martial array, if its purpose be not to force us to submission? (25) Can gentlemen assign any other possible motive for it? (26) Has Great Britain any enemy, in this quarter of the world, to call for all this accumulation of navies and armies? (27) No, sir, she has none. (28) They are meant for us; they can be meant for no other. (29) They are sent over to bind and rivet upon us those chains which the British ministry has been so long forging. (30) And what have we to oppose to them? (31) Shall we try argument? (32) Sir, we have been trying that for the last ten years. (33) Have we anything new to offer upon the subject? (34) Nothing. (35) We have held the subject up in every light of which it is capable; but it has been all in vain. (36) Shall we resort to entreaty and humble supplication? (37) What terms shall we find which have not been already exhausted? (38) Let us not, I beseech you, sir, deceive ourselves. (39) Sir, we have done everything that could be done, to avert the storm which is now coming on. (40) We have petitioned; we have remonstrated; we have supplicated; we have prostrated ourselves before the throne, and have implored its interposition to arrest the tyrannical hands of the ministry and Parliament. (41) Our petitions have been slighted; our remonstrances have produced additional violence and insult; our supplications have been disregarded; and we have been spurned, with contempt, from the foot of the throne. (42) In vain, after these things, may we indulge the fond hope of peace and reconciliation. (43) There is no longer any room for hope. (44) If we wish to be free, if we mean to preserve inviolate those inestimable privileges for which we have been so long contending, if we mean not basely to abandon the noble struggle in which we have been so long engaged, and which we have pledged ourselves never to abandon until the glorious object of our contest shall be obtained, we must fight! (45) I repeat it, sir, we must fight! (46) An appeal to arms and to the God of Hosts is all that is left us! Patrick Henry’s “Treason” speech before the House of Burgesses on May 30, 1765. 29. The refutatio presents and refutes counter arguments. In paragraph 4 Henry uses procatalepsis, an argumentative strategy that anticipates an objection and then answers it. What argument does he anticipate and what two rhetorical strategies does he use to refute it? He anticipates the argument that the Colonies are too weak to fight. He answers it through tonal shifts and appeals. 30. Henry shifts tone in the beginning of this paragraph to irony, the use of language that conveys the opposite of the intended meaning. How does he convey a ironic tone? Cite evidence from the text. He uses ironic rhetorical questions — questions that convey the opposite of what he attempts to argue. Examples include “Will it be when we are totally disarmed, and when a British guard shall be stationed in every house” and the two questions that follow it (sentences 50, 51, and 52). 31. How does Henry shift from a ironic tone back to his urgent argument? Cite evidence from the text. 32. In sentence 58, what does Henry mean by “we have no election”? He means there is no choice but to fight. 33. Most of the British military action to this point had occurred in and around Boston. How does Henry attempt to connect the fate of Virginia to that of Boston, and why would he wish to make this connection? He uses the possessive pronoun “our” when discussing the chains, even though the clanking is heard is Boston. This addresses one of the objections made by southern colonies to taking up arms against the British — that the “trouble” was centered in Massachusetts, not Virginia. 34. Asyndeton is a series of phrases or words with conjunctions deleted. Find an example of asyndeton in this paragraph. What is its purpose? An example is in sentence 57, “the vigilant, the active, the brave.” Henry uses this to emphasize the positive qualities of those who will take up the battle. 35. Find an example of Henry’s return to an image of slavery at the end of this paragraph. What is the purpose of returning to this metaphor yet again? (47) They tell us, sir, that we are weak; unable to cope with so formidable an adversary. (48) But when shall we be stronger? (49) Will it be the next week, or the next year? (50) Will it be when we are totally disarmed, and when a British guard shall be stationed in every house? (51) Shall we gather strength by irresolution and inaction? (52) Shall we acquire the means of effectual resistance, by lying supinely on our backs, and hugging the delusive phantom of hope, until our enemies shall have bound us hand and foot? (53) Sir, we are not weak if we make a proper use of those means which the God of nature hath placed in our power. (54) Three millions of people, armed in the holy cause of liberty, and in such a country as that which we possess, are invincible by any force which our enemy can send against us. (55) Besides, sir, we shall not fight our battles alone. (56) There is a just God who presides over the destinies of nations; and who will raise up friends to fight our battles for us. (57) The battle, sir, is not to the strong alone; it is to the vigilant, the active, the brave. (58) Besides, sir, we have no election. (59) If we were base enough to desire it, it is now too late to retire from the contest. (60) There is no retreat but in submission and slavery! (61) Our chains are forged! (62) Their clanking may be heard on the plains of Boston! (63) The war is inevitable and let it come! (64) I repeat it, sir, let it come. 36. The Peroratio, or conclusion, has several purposes, including: to restate an argument, to amplify reasoning, to inspire an audience, and to rouse emotional responses. Cite an example from the text of each of these four purposes. 37. What image does Henry use to convey that the battle has already begun? 38. In sentences 70 through 73, Henry uses a series of questions which directly challenge his fellow delegates. What is his purpose in asking these questions? 39. In sentence 75, probably the most famous sentence from this speech, Henry uses antithesis to set up a clear contrast. What does he contrast? What is the effect of this contrast? He contrasts liberty and death, concluding that without liberty death is preferable. 40. Sententia, especially useful in speeches, is an argumentative device that uses sound to sum up an argument. What is the sententia in this speech? 41. 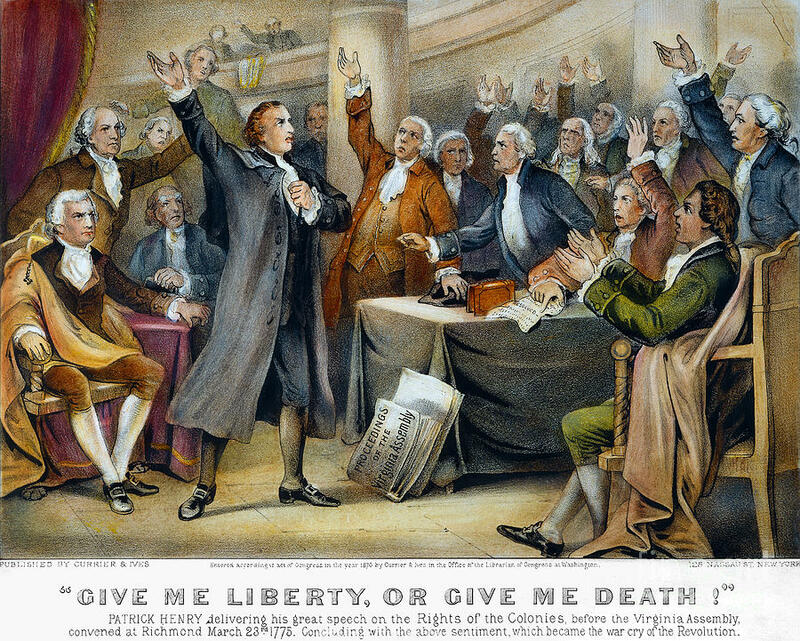 How does Henry’s final statement, “Give me liberty or give me death” represent the courage of both Henry and his audience? Henry states that he is willing to suffer a traitor’s death rather than be denied liberty. This was an either/or choice with nothing in between, and a traitor’s death was quite likely if the patriot efforts failed. This indicates the courage that Henry displays by making the speech and by implication he recognizes the courage that will be necessary for his fellow delegates to take action. Review the statements Henry makes as he develops his arguments. (65) It is in vain, sir, to extenuate the matter. (66) Gentlemen may cry, Peace, Peace but there is no peace. (67) The war is actually begun! (68) The next gale that sweeps from the north will bring to our ears the clash of resounding arms! (69) Our brethren are already in the field! (70) Why stand we here idle? (71) What is it that gentlemen wish? (72) What would they have? (73) Is life so dear, or peace so sweet, as to be purchased at the price of chains and slavery? (74) Forbid it, Almighty God! (75) I know not what course others may take; but as for me, give me liberty or give me death! How might the format of the Henry speech apply to current events, especially in countries and regions of political unrest? If there had been social media in 1775 would this speech have been interpreted differently? Investigate the role of social media in the Arab Spring (2012) or other current events as directed by your teacher and then rewrite this speech for a social media platform. Share your results with your class.